9th Mile, Ri-Bhoi, 4 March 2019: The University of Science and Technology, Meghalaya today observed the 3rd death anniversary of former LokSabha Speaker and former CM of Meghalaya Late Shri PA Sangmawith floral tribute and speeches remembering him. The event was participated bythe Chancellor, Vice Chancellor, all the faculty members, students and staff of the University. Addressing the gathering, MahbubulHoque, Chancellor of USTM said that USTM is highly grateful to Late PA Sangma as he had a vital role during the enactment of the USTM Act in the Meghalaya Assembly in 2008. 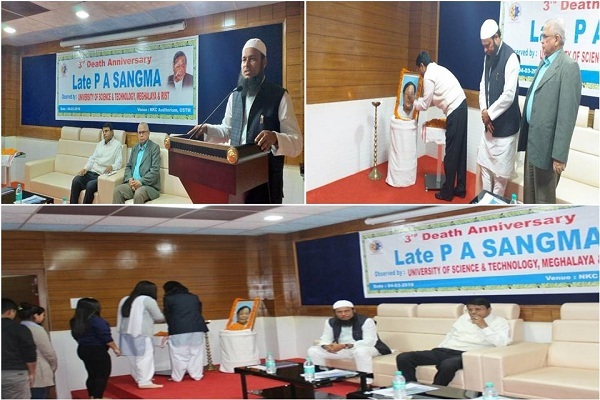 “Late PA Sangma was a visionary who wanted to nurture the young minds through education.He had always been a mentor and well-wisher and USTM is committed to him particularly for his support and encouragement in our initiative to establish a higher educational institution on the state of Meghalaya. We are also thankful to the then Chief Minister of Meghalaya DrDonkupar Roy and the then Education MinisterShriManasChoudhuri for their positive role”, he said. “We are really grateful to the present Chief Minister of Meghalaya ShriConrad K Sangma and his entire team for their immense moral support and help for progress of the University”, he added. It must be mentioned that during the past three years USTM has remembered this great personality in many ways and has been engaged in different activities as mark of tribute.Currently, one eight-story building is being constructed at USTM in his memory, and named PA Sangma International Block, foundation of which was laid by his two sons in May 2017.In September 2018, PA Sangma Chair Prof. for Tribal Studies was launched at USTM by Meghalaya Home Minister James K Sangma under which various research activities are being planned to be carried out. The most ambitious project of USTM in hand now is the proposed PA Sangma International Medical College and Hospital which will be established soon in USTM campus. USTM also instituted the PA Sangma Best Undergraduate Award which was first givenin its fourth Convocation held in September 2018 and will be continued every year.